Best waterproof speakers 2019: Budget, portable, smart | What Hi-Fi? Best waterproof speakers Buying Guide: Welcome to What Hi-Fi? 's round-up of the best waterproof speakers you can buy in 2019. If you're heading outdoors, you'll want a speaker that's built to withstand the elements. This is especially true if you're going near a body of water like the sea or a swimming pool. Generally speaking, electronics and water don't mix. But with a waterproof speaker, they mix as well as gin and tonic. These are designed to withstand being dunked in the drink, so you can blast tunes at the beach or pool without worrying about it breaking. So what should you look for in a waterproof speaker? Naturally sound quality is of prime importance - it doesn't matter how hardwearing it is, it's not much good if the sound is terrible. Waterproofing should also be on your wish list. That's not as obvious as it seems - some models are only splashproof, so make sure you check before you buy and think about how you're going to use it. One of the most common specifications is IPX7 - that means it's safe to immerse in water up to 1m deep for up to 30 minutes. IP67 means it has the same level of waterproofing, but is dustproof too. Bluetooth is a must, as it lets you play music wirelessly from your phone or tablet. And unless your mobile device is waterproof, you'll want to keep it safely away from the wet stuff. Wi-Fi is less essential, but a great addition if you'll be using it at home a lot and want to integrate it into your smart home setup using its built-in smart assistant like Amazon Alexa or Google Assistant. Decent battery life is also a key consideration. Nothing spoils a day at the beach like a flat battery. We've rounded up the best waterproof speakers around, drawing on our authoritative reviews back catalogue. Whether you want a budget buy or a much pricier and more capable model, we're bound to have something for you. You can tell an Ultimate Ears speaker straight away from the colourful design, but there's a lot more to this firm than an eye-catching finish. It makes some of the best waterproof speakers around, as the rest of this list will attest. The UE Roll 2 is a great advert for the company: it's fun, easy to use, and sounds great. It also goes 15 percent louder than its predecessor, and even comes with its own inflatable dinghy for floating around the pool (told you it was fun). It's one of the more affordable options too. A great buy, even if you're not fussed about waterproofing. Xtreme style, extremely pleasant sound. At first glance, this speaker seems a little brash: the name is like something a college jock would pick, it's big and it weighs a ton. But the sound is surprisingly subtle. It's like finding out the school bully does ballet in his spare time. The carry strap will help you lug it around, and it can daisy chain with another Xtreme 2 to give even beefier sound (but be warned: two of these things at the beach will be loud enough to summon the lifeguards). If you're looking to start a full-on pool party, this should be at the centre of the mayhem. Decent sound, rugged build... the ideal travel companion? At only a little bigger than a Coke can, this is one of the smaller waterproof speakers around. But it's proof that good things come in small packages: it's a doddle to use (those big plus and minus symbols are the volume controls) and is tough as anything. And the sound is way beyond what we'd expect from such a diminutive and affordable speaker. The icing on the cake? It floats. So don't worry about dropping it in the drink. An energetic performance meets a fun-loving design. Thought waterproof speakers were a little... basic? Think again. This one boasts Amazon's Alexa smart assistant, so you can use it to control your smart home appliances, change radio station, read you the news and all that jazz. There's also an optional charging stand (which costs extra) for juicing it up wirelessly from a plug socket. Its 360-degree design fills rooms with sound, too. Or poolsides, or beaches, or where you choose to use it. A great option if you can spend a little more. Delivers superb sound inside or out. If you want a portable speaker that doubles as a charger for your phone or tablet, this is the one for you. Its mammoth battery goes for a staggering 20 hours before needing a recharge, and it has both USB Type-C and micro USB ports for juicing up your device on the go. 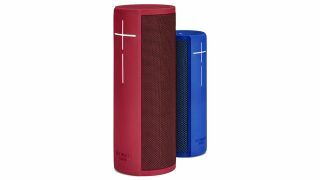 The design is sturdy and rugged, it has a mic for handsfree calls and JBL Connect lets you daisy chain multiple speakers for beefier sound. Not that you need it - one Charge 3 is loud enough to start a party, and sweet-sounding enough to keep it going. Highly recommended. UE's priciest speaker doesn't disappoint. This is a higher-end version of the Ultimate Ears Blast mentioned earlier - it's bigger, louder and more feature-laden. Amazon's Alexa personal assistant still comes as standard, giving you smart skills around the home, but the battery life is a little better. The sound performance is hugely enjoyable too, with little-to-no distortion even at higher volumes. High end, high volume, high class - that's this speaker in a nutshell. It might be small, but it makes a big impact. This speaker is only water-resistant, not fully waterproof like the others here. While it will survive "an accidental showering of water", don't go throwing it into the swimming pool and expect it to survive. But what it lacks in ruggedness it more than makes up for in features: you can use it to talk to your phone's smart assistant (like Siri or Google Assistant) even if your phone is in another room. And the sound is impressively big and bold, especially for such a small speaker. Punchy, exciting and full of fun, it's another winner from Ultimate Ears. Like the Wonderboom, this speaker floats in the pool, so can bob along entertaining you while you smash out a few lengths. The button on top is surprisingly versatile - it can skip tracks, play and pause, and even summon a playlist - and you can pair hundreds of the blighters to create quite a din. The sound is as fun as ever, highly enthusiastic while never being in danger of losing control. The bass is deeper than previous generations too. Definitely worth a look.